I should have started a thread for this years ago when GM started closing plants. Oh well, better late than never. Laying off workers and closing plants as exports and production plunge — Jaguar Land Rover is the biggie. 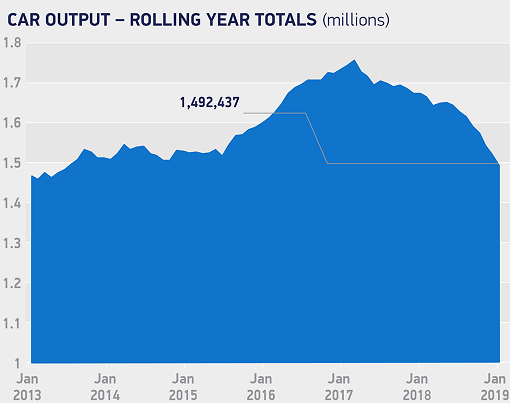 Car production in the UK slumped by 18.2% in January compared to January 2018, after it had already plunged 19.6% in November and 22.4% in December, as a result of sharply declining demand in key export markets such as Europe and China. Rolling-year total production hit a post-crisis peak of around 1.75 million units in mid-2016, just after the Brexit referendum. Since then, rolling year totals have fallen 12% to 1.49 million last month, down by over 250,000 units from the 2016 high. “Regulatory changes and ongoing uncertainty over future diesel policy and taxation were exacerbated by declining consumer and business confidence,” the SMMT said. Just over one in five of the 127,649 cars that came off the production line this January went to the home market, 4.8% fewer than last year. But it was in the export market, accounting for nearly four out of five cars produced in the UK, where the biggest decline was registered. Exports dropped 21% in January, from 119,000 to 97,000, the seventh monthly fall in a row. As SMMT reports, weakening demand in key Asian and European markets drove much of the decline, with exports to the EU27 countries down by 20%, and with exports to China collapsing by 72%. Against this backdrop of heightened uncertainty, fresh inward investment in the sector plunged in 2018 to just £589 million – down by 46.5% from 2017. Three quarters of UK automotive businesses say they fear a “no-deal” Brexit will threaten their future viability, according to a new member survey conducted by SMMT. Half of the respondents say they have already been hit by uncertainty, with one in five having lost business and a third cancelling or postponing UK investment decisions. Automakers and their suppliers in Europe rely on “just-in-time” and “just-in-sequence” delivery and production systems. A disorderly Brexit has the potential to hugely disrupt these processes. If there has to be a Brexit, car manufacturers would much rather it were based on a withdrawal agreement “that offers breathing space to negotiate ambitious future relationship and frictionless trade,” according to SMMT. In the current state of play, the chances of that happening are wafer slim. In January, Jaguar Land Rover announced plans to cut 4,500 jobs citing the declining popularity of diesel engines and a slump in sales in China. In early February Ford announced 400 job losses at its Bridgend engine parts site. Ford, which employs around 13,000 people in the UK, also warned that it will not hesitate to shift production out of the UK in the event of a disorderly Brexit. “We will take whatever action is necessary to preserve the competitiveness of our European business,” it said. Nissan has also warned it is reconsidering an earlier commitment to build its X-Trail SUV in Sunderland. On February 19, Honda unveiled plans to shut its Swindon manufacturing plant by 2021 after operating for almost 30 years in the UK, resulting in the direct loss of 3,500 jobs and thousands more in the broader supply chain. The company insists the decision is not related to Brexit but is a product of global changes in the industry. UK engine manufacturing was also down in January, by 9.5%, with 241,700 units built, compared to 267,000 units during the same month of 2018. It’s not all doom and gloom, of course. For example, Jaguar Land Rover recently said that despite all its recent travails, it is preparing to make a major investment in advanced manufacturing in the UK, though nothing concrete has yet been announced. There was also a 49% year-on-year surge in production of commercial vehicles this January after demand from overseas rose 25% and from the UK 97%. That came on the heels of 8.5% growth in 2018. Granted, that was preceded by two years of decline. And, of course, the UK’s output of commercial vehicles (9,182 units in January) is small relative to its car output (120,649 units in the same month). But right now, the UK’s automotive industry — like many other national automotive industries — must take its silver linings where it can find them.